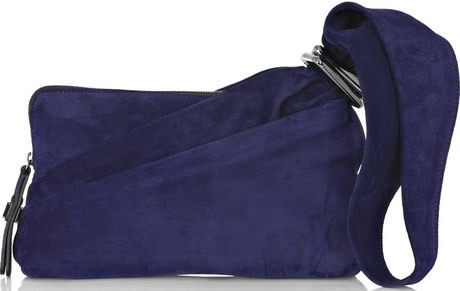 In my mind, calling a bag a “wristlet” is a precarious thing to do for a manufacturer or retailer. The word “wristlet” brings about a very specific type of simple, relatively inexpensive small accessory; personally, I use a wristlet to hold the small pharmacy that I carry around inside of my real bag. I wouldn’t ever pay a thousand dollars for something like that. I am having one of those moments. 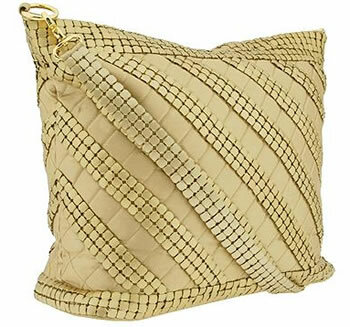 I keep staring at the Donna Karan Goatskin Loop Pouch knowing that I have seen something familiar from another designer, knowing that I featured it on Purse Blog previously. For the life of me I can not remember and can not find it when searching. So on a random note, whoever finds what I am talking about gets a virtual cookie! Back to this Donna Karan pouch. Can I just say that I adore it? 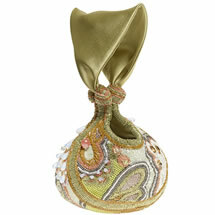 Hands free is so integral and having a loop pouch does the trick magnificently. I love the rocker edge given to this bag with the metal zipper. I don’t doubt that the goatskin is amazingly supple as well. Once you slide this on your wrist, you are good to go. Dimensions are 7″W X 8″H X 3″D. I love this design! 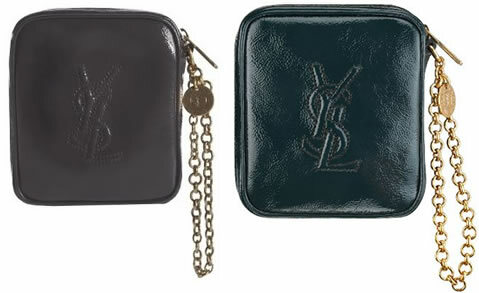 Come on designers, hop onto the wristlet wagon, it is a fun ride. Buy through Saks for $695. It’s all about hand-held bags. They may life easy, keep those arms and shoulders from hurting, and can be flung on the wrist like an over-sized dangling bracelet. I often travel with my Louis Vuitton Wapity which is a godsend. For a funky over sized clutch, the Jimmy Choo Foldover Calfskin Clutch is the perfect mix of shiny leather goodness and stylish gold tone hardware bling. 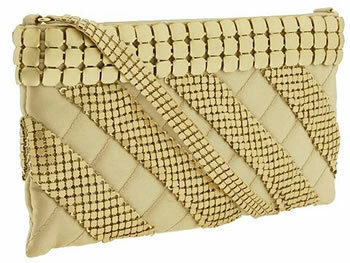 The bigger the clutch the more that can be held, which is always a plus (dimensions are 9Â½”H X 13″L X 2″W). There is ample store room, including an outside zip pocket, interior zip pocket, and interior card pockets along with a wrist strap and suede lining. 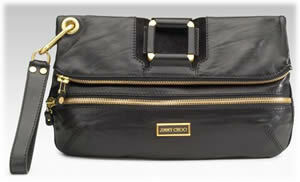 I’ve got an itch for this bag; playful, young, rocker, practical, and or sale through Saks for $1250. Over the weekend I went to a crafty store/restaurant with two of my momÃ¢â‚¬â„¢s sisters. This place was a barn turned into a craft store, and every woman across the Midwest was there on Sunday. The ratio of women to men was about 1,345:1. And that 1 was definitely and infant boy. Either way, all those crafts are cute but I did realize I could probably make many of them. I asked myself why I don’t, and realized the answer was simple; there are other people that will do it for me instead. Score. But as I ventured to the clothing and accessory side of this place, I did run into some cute and some not so cute handbags. I was surprised to see an actual brand of bags there. 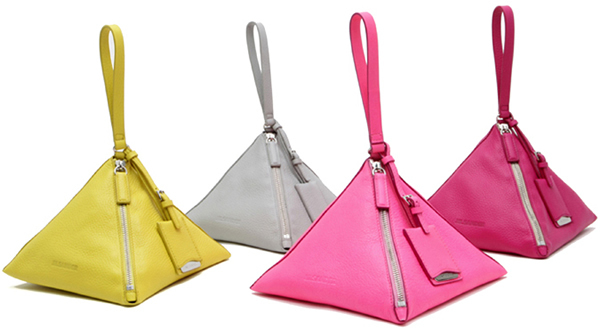 It is a brand I never heard of, but it is a brand after all- and it has very fun bags. Megs and I, we both *love* Coach. Reasons are several, the style, the colors, the price, the quality, and many more. 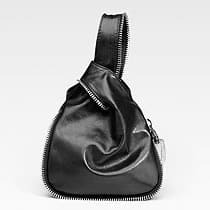 Another aspect that strikes us positively is that they keep releasing mid-season styles for bags in their signature shapes. Recall the Valentine’s Day specials or the Soho line? The brand-spankin’ new Coach Patchwork Bags take a different approach. For all those gals who just can’t decide what they like better, calfskin, some metallic accents, swank suede, the new tie dye canvas or their signature fabric, Coach is now making the choice ridiculously easy by combining all of the mentioned in the Patchwork line. Awesome! I think it’s just absolutely fabulous, very sporty looking and perfect for the everyday business of yours. The tote on the very left is the Coach Signature Patchwork Shoulder Tote and weighs in at $378 through Coach directly. 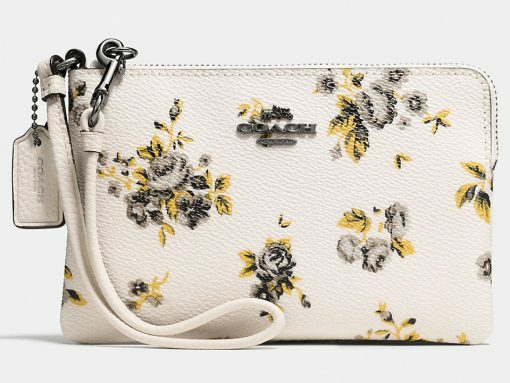 The Coach Signature Patchwork Wristlet is their patched up interpretation of the beloved classic and goes for a mere $78 bucks. Lastly, on the right, we gots the Signature Patchwork Demi, the mid-sized handbag by Coach for $198. Verdict: We love ’em all and can’t wait to get one for Lady Meggers! P.S. How would a matching Cruiser Hat look on me? Just kidding.